September 17, 2018, Rotterdam, the Netherlands – When His Holiness the Dalai Lama met six Dutch Parliamentarians this morning he was swift to tell them how much he appreciates their concern for Tibet. As time goes on more and more people come to appreciate that Tibetan culture is sophisticated and useful, while it is being steadily destroyed in Tibet. He pointed out that Tibet has always been politically significant as a buffer between India and China. “We’re not seeking independence because it would likely be difficult to achieve, but if we did, we would remain poor. Tibetans are no more averse to prosperity than anyone else. If we remain with the People’s Republic of China (PRC) we can benefit from China’s powerful economy. “The Chinese constitution recognises various Tibetan areas and we should have the freedom to preserve our language and culture in those regions. We can work together, the Chinese can provide us with material benefit, and we can offer them spiritual support. I greatly admire the spirit of the European Union which gives more importance to the common good than narrow national sovereignty. We could enter into a similar union with China. “Historically Tibet was an independent state. Chinese documents record the existence in the 7th, 8th and 9th centuries of three independent empires—China, Mongolia and Tibet. Subsequently, no Chinese records from the Tang dynasty until the Manchu dynasty refer to Tibet as part of China. However, the past is past and I note that members of the European Union remain sovereign states. “In 1951 we raised the issue of Tibet at the UN—nothing happened. Again in 1959 and 1965 we appealed to the world body over India’s objections, but again nothing happened. Pandit Nehru told me that the USA would not go to war with China to liberate Tibet. He said we could only talk to the Chinese authorities. On one occasion he came to see me, bringing a copy of the 17 Point Agreement that refers to ‘the peaceful liberation of Tibet’ and pointed out which points we could usefully discuss. “In 1956 Nehru insisted I return to Tibet after visiting India and I did. I tried to accommodate Chinese demands until the situation ran out of control. 6 million Tibetans are tough. The Chinese have used all kinds of means to crush the Tibetan spirit without success. Meanwhile, 340,000 have been killed, died of starvation or committed suicide. One of the Parliamentarians asked how educational systems could be made less materialistically oriented and His Holiness told him he thought it was more important to inculcate inner values and explain how to cultivate peace of mind. It should be possible for education to enhance the positive qualities students have from birth. His Holiness took up the theme. “Today, I’ll be teaching this small text, the ‘Eight Verses for Training the Mind’, which is mainly about altruism. As Paula has just said, everyone can find it useful, not just Buddhists. Whether you’re Jewish, Christian or Muslim, genuine practitioners all value the practice of loving kindness. Sometimes if the book we’re looking at is thick it can become boring, but this one is small enough to slip into your pocket. I received this teaching when I was about 15 or 16 years old. I memorized the text, recite it daily and have found it useful. “First of all I’ll go over the basic structure of the dharma. Buddhism is one of the major spiritual traditions to originate in India. Like Jainism and one of the branches of the Samkhya School, there is no place for a creator god. The founders of these traditions, such as Mahavira and the Buddha, were human beings who attained enlightenment. They employed practices prevalent in India such as methods for cultivating a calmly abiding mind and special insight (shamatha and vipashyana). In the case of the Buddha, as he delved deeper into the nature of the mind and investigated the nature of self, he concluded that there was no self independent of the body/mind combination. “Through the elimination of karma and disturbing emotions there is cessation. These come from mental exaggeration or fabrication. Here, ‘profound and peaceful’ can refer to the cause and effect of suffering and its origin within the cycle of existence, as well as the cause and effect of cessation and the path that are factors of liberation—in other words the Four Noble Truths of the first turning of the wheel of dharma. ‘Free from complexity’ refers to emptiness and the Perfection of Wisdom teachings of the second turning of the wheel. ‘Uncompounded luminosity’ refers to the subjective clear light explained in the third turning of the wheel. This subjective mind of clear light is essential to Highest Yoga Tantra. “In this first statement after attaining enlightenment, the Buddha refers to what he would teach in the future. Subsequently, at the request of his disciple Kaundinya and non-human agents he did teach. The first teaching that took place in the Deer Park outside Varanasi entailed an explanation of the Four Noble Truths. The cause and effect of suffering and its origin is described as afflictive cause and effect, while the cause and effect of cessation and the path is non-afflictive cause and effect. “Each of the Four Noble Truths can be understood in relation to four characteristics. The truth of suffering, for example, can be understood as being impermanent, in the nature of suffering, empty and selfless. The characteristics of the truth of the cause of suffering are causes, origin, strong production and recurrence. The truth of cessation can be understood in terms of cessation, pacification, being superb and definite release, while the truth of the path is characterized in terms of path, awareness, achievement and deliverance. Reflecting on these is a powerful practice. 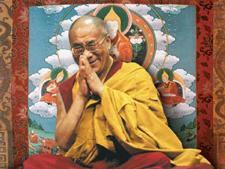 His Holiness observed that ignorance and wisdom are states of mind that are opposed to each other. Just as when there is light, darkness is gone, so the wisdom of no-self and emptiness utterly uproot ignorance. The Perfection of Wisdom teachings explain the Four Noble Truths thoroughly, especially the truth of cessation and the truth of the path. Nagarjuna says it’s by understanding dependent arising that we really come to grips with the Four Noble Truths. If you understand this, you will understand the importance of the Two Truths, the conventional reality that things exist, and their ultimate reality in emptiness. His Holiness went on to discuss the explicit and implicit content of the Perfection of Wisdom teachings as outlined in the ‘Ornament for Clear Realization’ of Maitreya/Asanga. The explicit content is the explanation of emptiness, but what is implicit is the stages of the path. According to the latter, the path begins with the Two Truths, goes on to explore the Four Noble Truths, leading to a proper understanding of the Three Jewels, who the Buddha is, what he taught and the role of the Sangha. He explained that the style and order of the ‘Lamp for the Path’ that Atisha taught, and which was the pattern for the subsequent Stages of the Path genre, presupposes that readers already have some understanding of the dharma. In the context of practice, His Holiness referred to the need for high status or a good rebirth in order to be able to keep it up. Nagarjuna’s ‘Precious Garland’ lists sixteen causes of high status. Thirteen are activities to be stopped. Of the ten unwholesome deeds to be avoided, three are physical – killing, stealing and adultery; four are verbal – false, divisive, harsh, and senseless speech; and three are mental – covetousness, harmful intent, and wrong views. Three additional activities to be restrained include drinking alcohol, wrong livelihood and doing harm. There are three further activities to be adopted – respectful giving, honouring the honourable, and love. Taking up the text of the ‘Eight Verses’, His Holiness began to read. He explained that the first verse highlights how we are all dependent on others and shows how to cultivate the awakening mind. There are two principal methods: the Seven Point Cause and Effect and Equalizing and Exchanging of Self with Others. The second verse advises regarding others as superior to you. The third counsels being wary of disturbing emotions, while the fourth speaks of the value of holding troublesome beings dear. The fifth verse recommends offering the victory to others, and the sixth recommends seeing enemies as spiritual friends. The seventh verse explicitly expounds the practice of giving and taking in which imagining taking on others’ suffering accords with great compassion, while giving happiness in return accords with loving kindness. Referring to this practice as secret indicates that it may not be appropriate for everyone. Finally, the first two lines of the eighth verse warn against giving in to the eight worldly concerns for praise and blame and so forth. Noting that the last two lines refer to seeing all things as like an illusion, His Holiness mentioned that you don’t have to be a Buddhist to understand emptiness. For the Dalai Lama Foundation, Reinier Tilanus announced that 21,000 people had participated in the public talk and teachings, 400,000 had viewed the live stream and 250 volunteers had been of great help. The account for the last three days’ events in the Netherlands had produced a surplus of 70,000 Euros. His Holiness requested that 20,000 be donated to supporting teaching Tibetan language to Tibetan children in the Netherlands. The balance will be donated to the work being developed at Emory University to promote social, emotional, and ethical development. Tomorrow, His Holiness will travel to Germany.